Zombies!!! 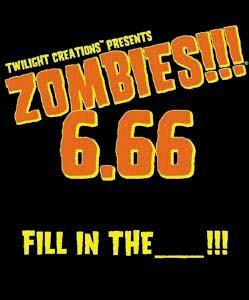 6.66 Fill in the _______!!! ZOMBIES!!! 6.66 FILL IN THE ____!!! adds... Well, honestly it adds nothing. But thatâ€™s the cool part. We provide the blank cards and tiles with the official Zombies!!! backs. You provide the rest.